Six of the Seven Samurai on patrol. The Skinny: A farming community hires seven exceptional swordsmen to defend their village in this unforgettable film from Akira Kurosawa. Highly influential and widely praised, The Seven Samurai is nothing less than a cinematic masterpiece. Accept no substitutes. "Fast-paced" isn't the first term that comes to mind when one talks about epic films, particularly those that clock in at over three hours in length, but The Seven Samurai is the rare exception. 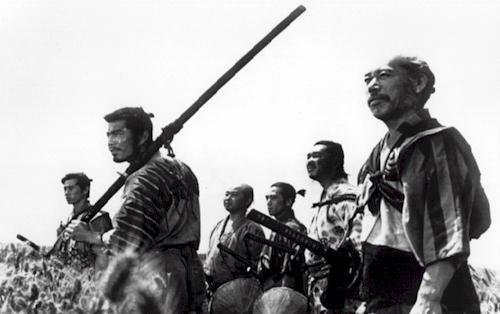 For a film that is at once funny, touching, and not to mention thrilling, it's no wonder that The Seven Samurai became the prototype for all other "men on a mission" films that would follow in its wake. From Westerns like The Magnificent Seven and The Wild Bunch to modern fare like Reservoir Dogs and Ocean's 11, practically every modern action movie with an ensemble cast owes some debt to Akira Kurosawa's samurai classic. In The Seven Samurai, some dirt-poor farmhands enlist the services of the titular seven samurai to protect their town from a group of marauding bandits. With nothing to offer but three square meals a day, the farmers struggle to find anybody who would be willing to help. After some initial hardships, they manage to recruit Kambei (Takashi Shimura), a noble warrior who eventually becomes the team leader. Gradually, more samurai join their ranks, including the expert swordsman Kyuzo (Seiji Miyaguchi) and the eager greenhorn Katsushiro (Ko Kimura). Of course, the group dynamic would not be complete without the team wildcard, a role which is soon filled by Kikuchiyo (Toshiro Mifune), a comical, wholly unrepentant rascal whose motivation for helping the villagers turns out to be far more palpable than his teammates realize. With their strike force assembled, the farmers lead their heroes to their community where the warriors proceed to train the inhabitants, prepare the fortifications, and await the coming battle. In the stunning conclusion, this ragtag group of heroes makes a final, fateful stand against the bandits, but not everyone is standing by the final reel. One of the key aspects to the success of The Seven Samurai is its consistent sense of humor. From the hilarious samurai auditions to the nutty antics of Kikuchiyo, the film effectively uses comedy to maintain the viewer's attention over the course of the film. And unlike this film's contemporary offspring, The Seven Samurai does not degenerate into yet another mindless, simplistic action flick. Though the "good guys" and the "bad guys" are clearly delineated, the filmmakers play around with moral ambiguity. For example, the villagers aren't quite as helpless or innocent as they present themselves to be. Though desperate for help, the villagers reveal a petty and childish side when they do not welcome the heroes, and proceed to hide the town's women from them in fear that they will lose them to the samurai. Similarly, the ronin learn of their own class biases when unpleasant information is revealed about the villagers. Notes:  While Toshiro Mifune's character in The Seven Samurai does not reveal his real name (Kikuchiyo is an alias), he is not the wandering swordsman known as Sanjuro who Mifune also played in later Kurosawa films. Though Sanjuro does give an alias in both movies, events in The Seven Samurai clearly overrule a direct connection.  Though his character Kyuzo is shown to be an elegant, keenly proficient swordsman, Seiji Miyaguchi hadn't even touched a katana before starring in this film.